The Bode Museum’s complex architecture already pleased me from the outside. But I chose it for my guide work with Multaka because I am very interested in the Byzantine art and the sculpture collection shown in it. In Damascus, I studied architecture, was interested in Byzantine music, and sang in a church choir. Here in Berlin I am writing my Masters thesis in Architectural Design on the relationship between music and architecture. One of my favorite items in the Bode Museum is the dancer by the Italian artist Antonio Canova (1757 - 1822). It was at the center of the special exhibition “Canova and the Dance”. Alongside it were additional sculptures, sketches, painting studies, and a reconstructed plaster model that illustrated his work methods. The latter reminded me of my own procedure when working on architecture projects: first, I sketch the structure and the movement sequences, then I painstakingly draw the designs, and then I produce the models. I’m fascinated by how Canova expresses the dancing motion of the female body in a sculpture carved from marble stone and how her clothing lightly wafts and seems downright transparent. And it was created in a time when there were no machines and everything had to be done by strenuous manual labor. I also like the beauty of this young woman and her joyful expression while dancing. When you dance, it means you are content. I understand that well, because I like to dance, myself. I would like to convey something of that when I bring visitors here on my tours. My starting point thereby is always art as such. First, I explain how a museum is structured, what function and history it has, and how one can learn something in it about life in other epochs and cultures. Behind the exhibits here in the Bode Museum stands the Christian religion, of course, beginning with the Byzantine era. By directing the visitors’ gazes to specific details and telling them something about the artist’s working methods, I help them to perceive works of art as such and to recognize their particularities. This always occurs in conversation, with the group’s active participation. If someone wants to talk about something else, I say: let’s first talk about art, and we can talk about the other thing afterward. I want everyone to be more or less satisfied at the end of a tour. I myself thereby learn a lot about the people whom I guide through the museum; that’s why I enjoy doing it so much. 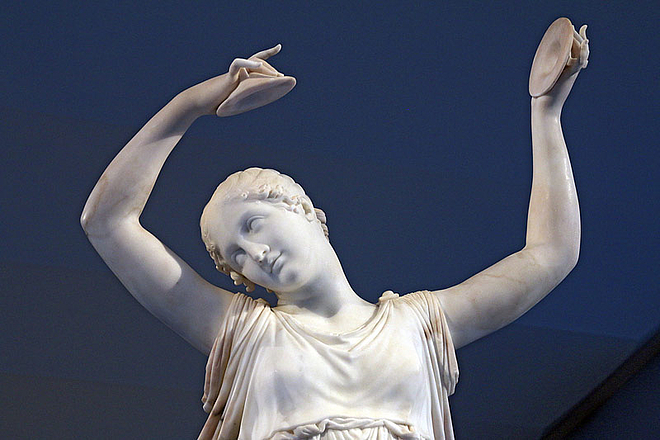 This marble sculpture and two others are considered the high point of Canova’s dealings with the beauty of dance, a theme that particularly interested him all his life. He created this Dancer on commission from Count Andreas K. Razumovsky, the Russian Ambassador in Vienna. The figure can be turned on its pedestal, so that the original owner could view it with light falling on it in different ways. The figure was at the center of the special exhibition "Canova and the Dance" from 21 Oct. 2016 to 22 Jan. 2017 in the Bode Museum. 2012, completed a Bachelor’s Degree in Architecture from the University of Damascus with a medal for excellence. 2013-2014, work at the University of Damascus as a researcher and lecturer. 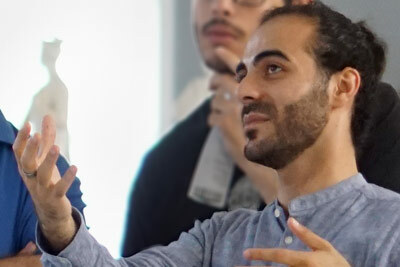 Came to Berlin in October 2015; currently working on a Master’s in Architectural Design at the Technical University Berlin.